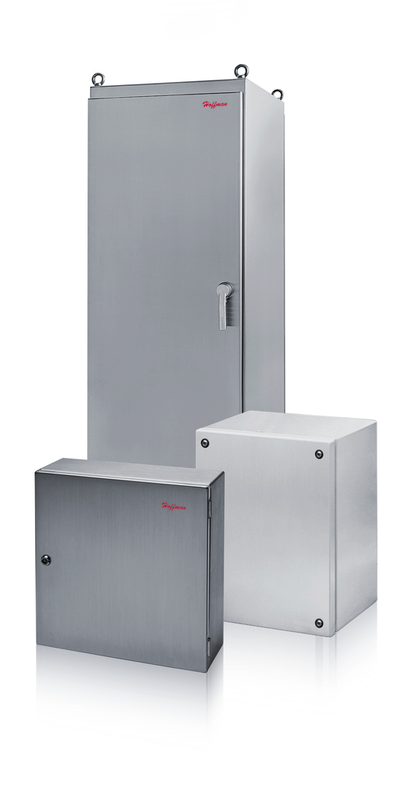 Hoffman stainless steel enclosures are designed for indoor or outdoor applications that require corrosion protection against chemicals and water. From humble to harsh environments, we safeguard vital electrical components with enclosures, climate control and accessories to help keep operations up and running smoothly. We also rigorously test all new product designs and manufacture them to meet electrical and environmental certifications including UL, CE, ROHS, IEC EX and more in our ISO 9001 manufacturing facilities worldwide. Our wall-mount enclosures GL66 feature streamlined styling with a stroked finish and 3mm double bit quarter-turn latches for secure closure. GL66 enclosures offer flexible internal mounting options, ranging from variable depth back panels to DIN-rail mounting provisions.